We had a reasonable first this morning - not that cold at -5C but some interesting effects. The ice on the trough was nearly an inch thick but was not that hard. We probably have the ball valve set a little high so as the ice forms, expansion makes the trough overflow. I did not fancy getting wet adjusting the ball valve this morning. Some lovely shapes in the ice crystals too. 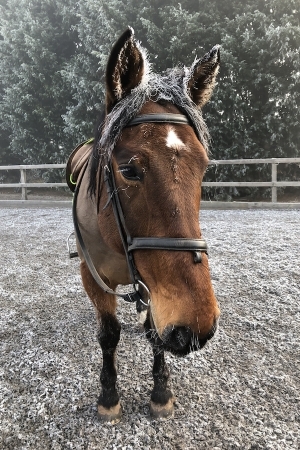 Teddy was not that impressed at his icy halo. That's one hell of a bonnet mascot. But he is a form of transport. He's a handsome chap - those shots are making me feel cold down here.. I love horses must be in my blood ( maybe the stallion in me ) . My very first memory is as a toddler about 3 y/old escaped from my grans and went to find my dad ended up in a stable near his garage . Half the village out looking for me. Several years ago when my Staffie wanted a walk I would head over the fields to the cliffs and a red Stallion was in the field he would walk over at his pace while I pulled fresh grass up for him. Then shove his nose in my jacket for his polo's . I used to take him carrots did get a funny remark of a mates wife about the bulge in my pocket . By did I miss him so friendly .